The ideal Thai meal is a harmonious blend of all the four flavours above. The dishes are meant to be equally satisfying to eye, nose and palate. A typical meal might include a clear soup, a steamed dish, a fried dish, a hot salad and a variety of sauces into which food is dipped. The meal is then rounded off with sweet desserts or fresh fruits. 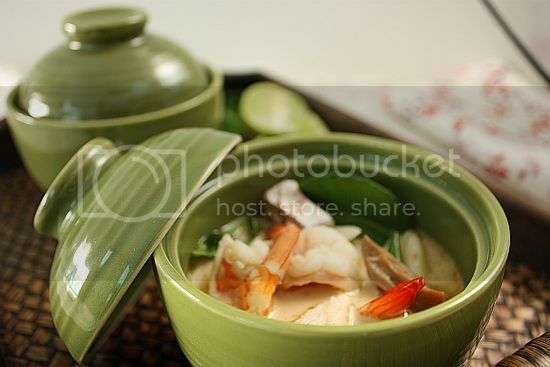 This particular tom yam dish which I have posted is probably the lesser known of the two. It is much lighter and less spicy and uses coconut milk. You would find this recipe using chicken instead of prawns. Preparation wise this dish is easy and takes no time at all to put together. End result is a really delicious soup. 2) Then add in the coconut milk, chillie and seafood and bring to a boil. 3) Add the mushrooms, lime juice and fish sauce to the pot. Cook the soup on medium heat, uncovered for another 5 minutes. 4) Remove from stove and dish out into individual bowls. Serve immediately. 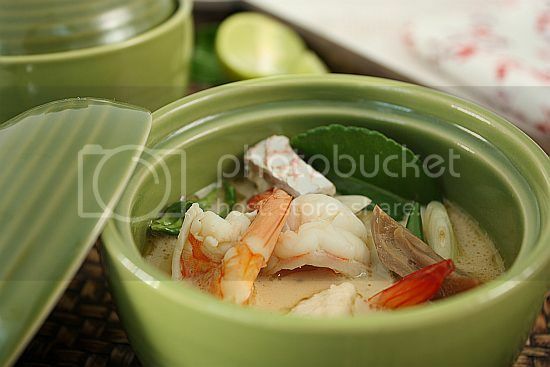 I love Tom Kha but I usually use Gai (Chicken. The list of spices you use in this recipe are exactly the same as what I would use! Awesome! Jo, this looks so appetizing! You should make this if we have another blogger's gathering! This soup will hit the spot now that we are in full winter mode. Happy New Year and all the best you in 2011. WOW Jo! This looks so yum..yumm.. Happy New Year 2011 to you Jo! 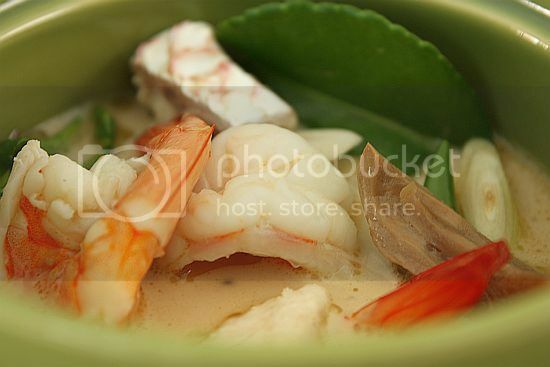 Your Tom Kha Goong looks so tempting ... Yum Yum .. This exotic colourful dish is mouth watering! Cocnut and prawn with a little bit or spice, nicely done! Jo, the soup looks so delicious! I love this Thai food, more than Tom Yum Kong. So creamy and flavoursome. Love your recipe. Yes, love the spicy, salty, sweet and sour of Thai food! Magic! This means that you actually kill fat by consuming Coconut Fat (including coconut milk, coconut cream and coconut oil).